Hero worship was prevalent in South India in ancient times and it reflected in certain literature. The heroes who died in war or dual fight were commemorated by hero stones by inscriptions. Later on these stones were considered as divine stones and people used to adore it. In North Kerala also the custom was there and lots of folk songs were still available regarding the heroes. It is believed that these were the origin of folk songs and folk arts. Kerala like many other regions of India is rich in folklore. People of different caste systems, adhering to the hierarchy of such systems, have lived here for many centuries. They significantly contributed to the making of the complex and varied patterns of existence in Kerala, which have accumulated in the folk tradition of the state. The village folk in their worship of the heroes, who had once lived among them, organized festivals incorporating ritualism, vocal and instrumental music, dance and painting. This blending of artistic forms in a historical pageant is a good example of the aesthetic imagination of the people. 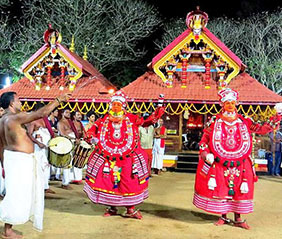 The ritual dance called Theyyam is a splendid example of this legacy with the entire region of North Malabar as its theatre. It is also called Theyyam or Theyyatam, Thira, Thirayatam. Attom means dance and Theyyam means God. Thus Theyyatam means the God’s dance. The dead hero’s spirit, out of which the conviction and courage for the heroic dead arose, is considered respectable and adorable such a spirits are attributed with Godliness. The dance was conducted before the Sthanas where the spirits used to reside and the village folks assemble to witness the ceremony as a part and parcel of their life and living.